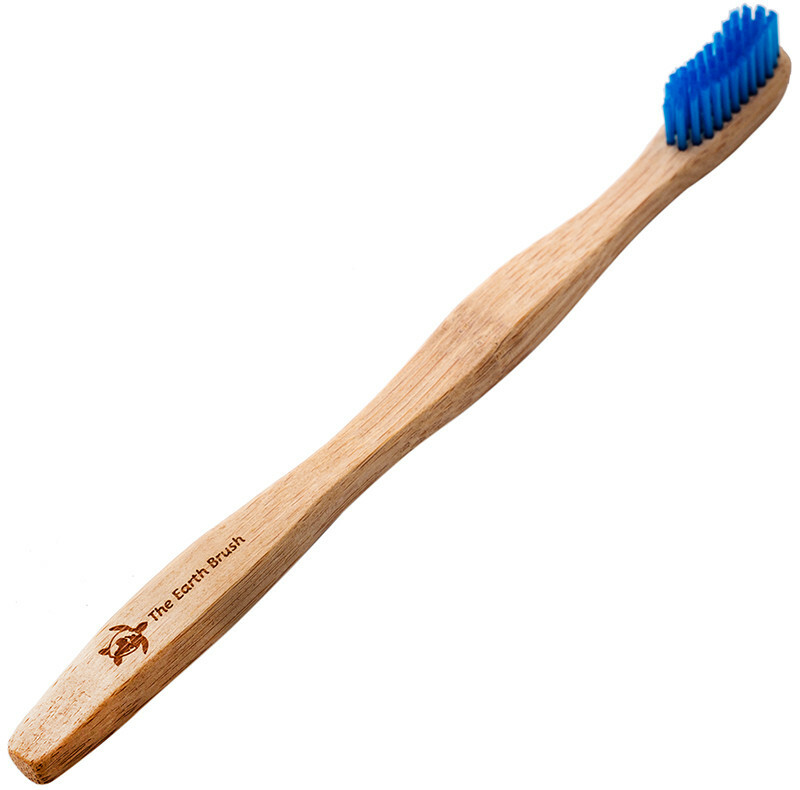 The Earth Brush’s Medium Blue Adult Toothbrush will have you grinning from ear to ear with its totally biodegradable handle. The Medium Blue Adult Toothbrush is the Goldilocks of toothbrushes, not too firm not too soft; just right! The Blue bristles also make it easy to spot which toothbrush is yours in the bathroom. Great brush but the medium is actually more like a soft. So will get a hard next time. Value for money and like the different colours. Great to know it can be recycled! The look is cool and the fact that the bristles are available in different colours is great. Eco-friendly and overall just great! Great product, and happy for the environment! Would say that the bristles are more of a softer medium, but still great to use. Love the blue detail. It's taken me some time to get used to it, but I finally am. The bristles are a little too soft for my liking - next time I'll go for a harder strength, and the bamboo feeling is weird at first. But it's been a month or so and I can say I'm used to it now and happy with it. I love this toothbrush. I have been using it for over a month and I'm very happy with it. I will definitely buy another one after 3 months. I love my bamboo toothbrush and I’m completely converted. Definitely a necessity! Good, ergonomic design of the head and decent size, even for a small mouth. Its comfortable to use and very gentle. This toothbrush works great with my homemade toothpaste and cleans so easily, leaving no residue behind in the bristles (with a good tap). I'll be trying the hard bristle toothbrush next though as I think this is a little on the soft side for me. Loving the Earth Brush Bamboo toothbrush! Loving this toothbrush! I love that the range has different colours and sizes for our family (before on other brands I would just initial the bottom for each family member) but this works great too. But more than that, the bristles don't fall out, it's medium but still soft enough and also lasts a long time without toothpaste collecting in the actual brush (like I've experienced with other brands). Very competitive pricing too! The bristles are just right and the size of the head is perfect for me. Will definitely buy this again. Strong bristles, but still soft. Boyfriend loves it! Local is lekker! And plastic free handle while you're at it! Love love love! Husband is happy with his toothbrush and it’s nice that they come in different colors so we don’t get ours mixed up! My father is a dentist so a toothbrush isn't something I have to buy, but I decided to be kind to the planet and buy this. I am in love with my toothbrush and will recommend it to anyone!! We especially enjoy using these toothbrushes. They work very well and they are completely biodegradable. Awesome product, bristles are just right. I enjoyed knowing I have thrown out my last plastic toothbrush. Save the ocean, one toothbrush at a time. Firm one was too hard, soft one too soft, this one is perfect! absolutely LOVE this brush! The bristles are not too hard and not too soft. I would definitely recommend this product for anyone who wants a fresh feeling after brushing your teeth and helping the environment while you are at it. THE most Awesome brush I have EVER used! just right for me. the handle is comfortable, the wood in mouth is not a problem at all,it is quite perfect as it is not bulky or knock against teeth. Rinses off easily (i use natural homemade and commercial toothpaste and it is all good).Highly recommend this brush! Great product, love the bamboo handle. Strong, durable, yet comfortable and gentle on the teeth and mouth. Would definitely recommend it! Great quality, better mouthfeel than other bamboo toothbrush brands that I have tried. Great brush - Handle is ergonomic, bristle quality is good. Prefer the medium bristles to the soft. Great toothbrush, grip very comfy and bristles get in the right places. And no plastic - brilliant! I absolutely love my earth bamboo brush...all my friends also want one now! Will never use anything else! wanted a toothbrush that is kind to the earth when it's finished. Cleans beautifully and eco friendly, what more could you want?! I prefer the soft bristles, I bought the medium bristle for my boyfriend. He loves it! Cleans beautifully and eco friendly, what more could you want?! GOOD QUALITY- do not like the feel of wood. Nice tootbrush and I'm glad I bought it but I realize I do not like the feel of the wood in my mouth. Feels gentle and love the color. I'm getting used to it! Great quality toothbrush. Not too hard or too soft. I love this product. It's great to know that biodegradable toothbrushes are even available. Before discovering this site, I'm ashamed to admit that I didn't even know that. This will be the only type of toothbrush I will ever consider using in the future. I've used some other bamboo toothbrushes, but this one is my favourite so far. The bristles are the perfect stiffness. I've used it for about a month and they haven't frayed or fallen out. Also easy to get the toothpaste out after brushing. Loving it! My first biodegradable toothbrush. I was pleasantly surprised by the quality of the bristles, and would definitely purchase this again. Absolutely great! Sturdier than some of the other brands. The medium is also not as hard as ons would think - just perfect. Love the blue!